RedLine SUSHI is a DSP based multi function module. It is switchable by software flashing to following 4 types of functions. 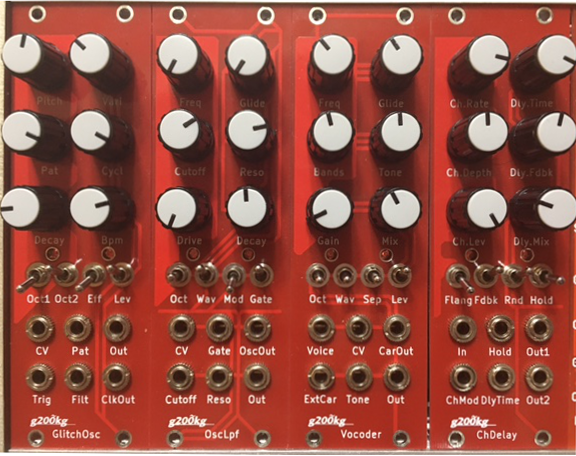 GlitchOsc : 2Osc+Lpf based random glitch oscillator. It genarate various tone syncing to Trig signal or internal clock. OscLpf : Osc + Lpf module. Lpf can behaive as low pass gate with gate input. Vocoder : digital processed vocoder. frequency resolution can be controlled. Including internal carrier oscillator. ChDelay : Chorus/Flanger + Delay effect. This is a tool for Eurorack Module 'SUSHI' firmware configuration.